When was the last time you went food shopping? You might have gone to a supermarket, a local grocer’s, a market stall, or ordered online. Wherever you shopped, you can be certain someone made a profit. The farmer or manufacturer made a profit selling his produce to the shopkeeper. The shopkeeper made a profit selling it on to you. And, in return for your hard earned cash, you got the food you wanted – whether it was a healthy meal or a sugary snack. Food is essential to life. You literally need to eat in order to stay alive. And most people would acknowledge that turning food production over to the Government would be a terrible idea. You only have to look at what happens whenever people try it. Profit-making in food production is not controversial amongst sane human beings. Yet many otherwise sane people are horrified at the thought that private companies might ever be involved in something so essential to life as healthcare. Again and again, “profit” was unashamedly demonised. The left wing politicians repeatedly used it as a boo-word, and the crowd duly applauded them for it. Profit, it seems, is a bad thing. I spoke to two friends several days after the debate, and both were emphatic that profit has no place in the NHS. They also thought key public services like the railways should be run by the Government. They are far from alone in holding these opinions. But, during our discussion, a few common assumptions stood out. Firstly, that private companies are greedy and corrupt, and therefore cannot be trusted. Secondly, that “profit” means low quality service, delivered as cheaply as possible at an extortionate rate in order to save money. And, finally, that “privatisation” is a dirty word because it means turning over precious “public services” to cutthroat profit-seekers. Sadly, it has become received wisdom that making a profit is morally wrong. 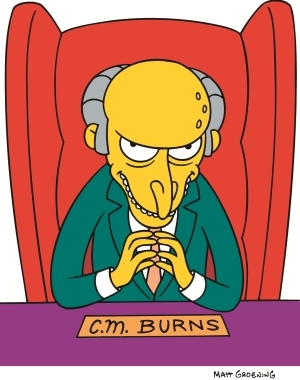 In this view, the typical profit-obsessed capitalist resembles The Simpsons‘ decrepit oligarch Mr Burns. He cares only about money, is obsessed with cutting costs, and is uncaring when his activities cause harm to others. He is negligent at best and gleefully evil at worst. This assumption is rarely challenged, so it is accepted as truth by default. That is lazy thinking at best, and an outright lie at worst. Struggling one-man-one-van entrepreneurs, artsy craft sellers, village shopkeepers, restaurateurs and online retailers all need to make money to stay afloat. Making a profit allows a business, whether it is a one-person small enterprise or a multinational corporation, to keep paying its staff, shareholders, and operating costs, or to put money aside for future investment. If a company is not making money it cannot do any of these things – its customers, investors and staff suffer. Incidentally, since companies are not people, those are the same people who get hit by corporation tax – through higher prices and lower wages. Profit also weeds out bad goods, services and companies. Put simply, if what you are offering is something other people want to buy, you will make money. If no one is buying it, you will make a loss. All other things being equal, good companies will flourish and bad ones will fail – provided they aren’t being propped up by governments, of course. Profit does not mean providing shoddy goods and services in order to cut costs. Companies that act this way will lose customers to competitors who offer better value for money. The idea that making a profit is dishonest is pure Marxist drivel, based on the labour theory of value – which holds that all value originates in raw materials and labour, therefore all profit not shared with the workers is illegitimate. That theory is false: value originates in the mind of the buyer. When you last bought a new shirt, you valued that shirt more than the money you paid for it. If you didn’t, you would have left it in the shop. Profit is not illegitimate. It is the reward entrepreneurs earn for taking a risk and providing you with the things you are prepared to pay for. It is also frequently assumed that profit-seeking is a bad thing because of greed. Greed is bad. Greed, we are told (rather simplistically) is the sole reason for the financial crisis of 2007/8. Greed is why workers get exploited, the rich get richer and the poor get poorer, etc. Sound familiar? Businessmen and women do not seek a profit because of ‘greed’ or any malevolent desire to ‘exploit’ their fellow human beings. We all seek to make money because we want to improve our own lives and leave a better life to our children. Profit-seeking entrepreneurs and businessmen are no different. As long as no one is forcing or tricking you into doing something you would not do otherwise, you are not being exploited. To make money we must offer people something they want, whether that is our labour, our ideas, or our money as an investment. We make a profit when other people value those things more than we do. Most of us give up our time in exchange for a wage we consider acceptable. Entrepreneurs and investors give up their time and money in exchange for a decent return. As for the rich getting richer, there’s nothing wrong with that as long as the poor are also getting richer – as in Chile, which has high inequality but the lowest rates of poverty in South America. And there’s plenty of evidence to suggest that in most of the world, poverty has been falling faster than ever over the last few decades. When government interferes with the profit motive, often with perfectly good intentions, the results can be catastrophic. The financial crisis did not happen because of ‘greed’. It happened because the US Government interfered in sub-prime lending, whilst central banks around the world held interest rates artificially low, and governments went heavily into debt to fund high levels of public spending. A huge amount of money was channeled into the housing market, driving up prices at a time when many buyers could not afford houses. A huge number of complicated financial products were used by lenders to obscure this inconvenient fact from the public. When the crisis hit, debt-ridden Western governments responded by cutting interest rates and printing money, in order to pay less interest on their debt. They also bailed out the banks, rewarding failure and bad business practices, while saddling ordinary people with an enormous tax burden for generations. It was not the profit motive that caused the crash, it was well-intentioned state policy, followed by the actions of desperate governments all around the world desperately attempting to avoid a self-created disaster. Profit is not a dirty word. It is a reward for providing people with the things they want. Without it, wages and investment would be stagnant, and there would be no innovative new products. No one would know what goods and services people wanted. The worst débàcle of modern financial history might have been avoided if the Government had simply allowed the financial sector to maximise profits, rather than turning money and banking into instruments of economic policy.